Sometimes it feels good to break the rules. Printmaking has many of them — perfect alignment, clean edges, no brayer marks. I had tried breaking some rules by working with the dyed silk, and even though this experiment did not work, I couldn’t let my key block image go. So I’ve decided to break some more rules in the search for blended, variegated colors. My key block from my last experiment. Sadly, I will need to carve a new one. 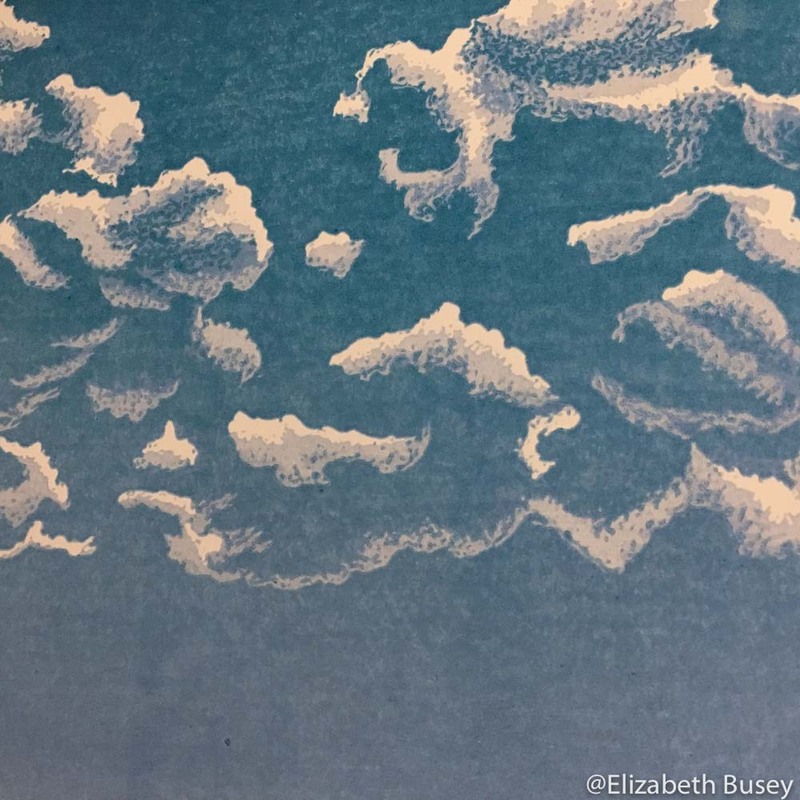 This entry was posted in Composition, Techniques and tagged brayer, breaking, ink, marks, printmaking, reflected skies, rules, uneven, water on January 13, 2017 by Elizabeth Busey. My dyed, glued and printed work, hopelessly warped and therefore impossible to register again. My first mistake was that I used untested materials in this linocut project. I had used a very lightweight silk for my Cope Hollow series, and blithely thought that if some silk was good, then a thicker silk would be better. I hypothesized that a slightly thicker weight fabric would be easier to control. It was easier to iron, but when I tried to adhere it with my combo of PVA and methyl cellulose, it stretched horribly no matter which way I worked with it. This lead to wrinkles in the fabric as it dried on the cotton paper. Cotton rag paper like the Rives BFK paper that I use has no sizing, so it quickly absorbs water. I knew when I began this experiment that any water would make the BFK ripple. I did need some methyl cellulose (which contains water) in my glue mix because the PVA was too thick and dried too quickly. On my smaller Cope Hollow series, the amount of glue mix use didn’t seem to make the paper ripple terribly. But with a 10 x 33in block size, the increased amount of glue mix made the entire paper buckle, despite being dried amongst blotters with added weight. Making something multiplicatively bigger often multiples the problems as well. I should have known that my registration set-up was going to be problematic. With my registration jig setup, some sacrificial paper is needed on one side for the attachment of the plastic tabs with masking tape. To most efficiently use my expensive paper, it made the most sense to put the tabs on the short edge. I learned many linocuts ago that it is very easy to misalign a long linocut because I’m placing the paper down from the side, and not head on. With the already warped paper, while I could manage to print the linocut in one color, I was completely unable to register the next color. Each attempt just got worse and worse, until I gave myself a studio time out and then decided to abandon the project. I still like the image itself, so one option I have is to cut another block the exact same size and use it to create the colors, printing my existing key block last. For now, I’ve put this block aside and have been coaxing some cumulus clouds from a similarly long block. 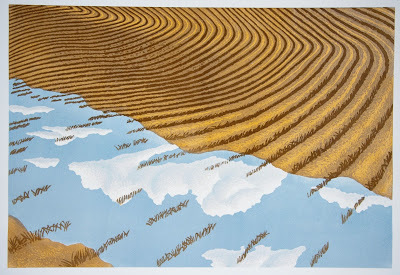 A section of a long linocut with towering cumulus clouds. No silk in sight. This entry was posted in Experimentation, Techniques and tagged artistic failure, Linocut, registration, silk, sizing, water on December 15, 2016 by Elizabeth Busey. 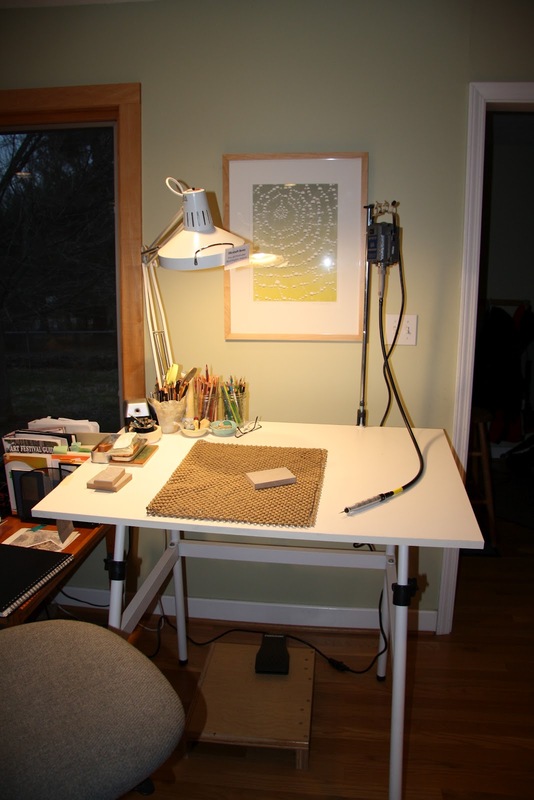 It has been a few months since I experienced that fabulous feeling of finishing a linocut. I recently put down the last layer of ink — my favorite metallic gold — and the work was transformed. For the final touch, I want to apply gold leaf to a few of the white ripples, so the water will be rippling one way, but the sun is coming from the opposite direction. A portion of my latest linocut, waiting for gold leaf. 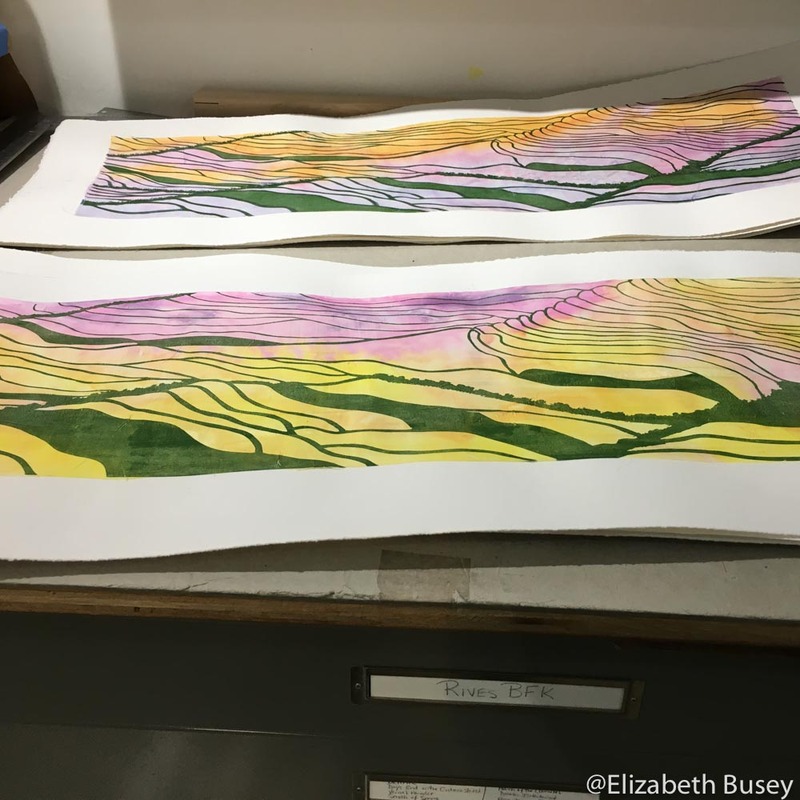 This entry was posted in Color Theory, Demonstration, Materials, Reduction, Texture and tagged gold ink, gold leaf, ink drying, Linocut, water on January 14, 2016 by Elizabeth Busey. I started out my adult art study with watercolors, a most unforgiving medium. Watercolor requires immediate commitment with the knowledge that it is difficult to undo what has been done. Yes, there is white, but it is opaque, unlike most watercolors. I was taught not to rely on it to fix my mistakes. I’ve carried my aversion to opaque white into my printmaking. For the first few years I used only inks thinned with transparent base, gradually building up my image. This had two consequences that I didn’t like. First, the initial layers were by necessity short on chroma. I rarely accomplished a brilliant yellow. Second, it made using a complementary or split complementary color scheme very difficult. No matter how much purple you put over yellow, you are always going to get some kind of brown. But all that has changed. I’ve started using opaque ink in places where I want rich colors, and don’t need that brilliant transparency of the white paper shining through the inks. 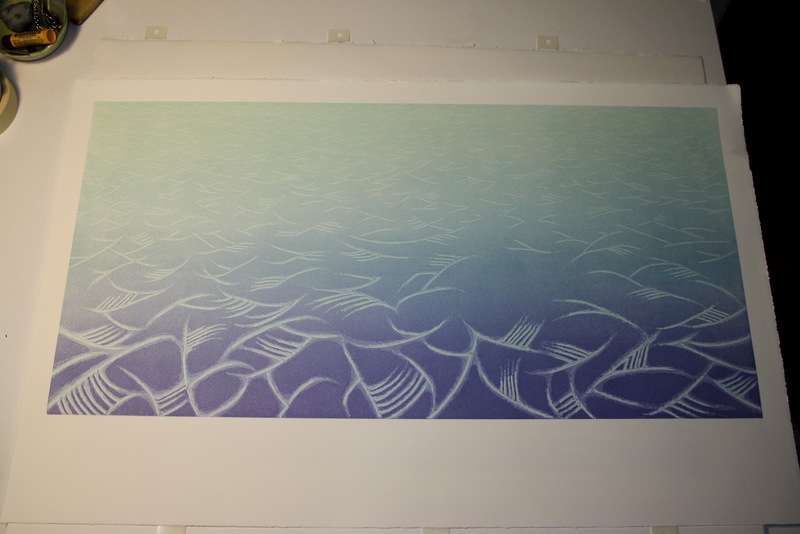 Two layers of transparent blue, including a rainbow roll provide the base of the linocut. This entry was posted in Color Theory, Experimentation, Materials and tagged opaque, titanium white, transparency, water on January 7, 2016 by Elizabeth Busey. Interconnection has always been one of the defining concepts of my work. In doing research for my latest linocut on alfalfa of all things, I read articles about pollination, bee species, crop rotation and water export controversies. Elizabeth Busey. In Praise of Honey and Cream. Reduction linocut. 14 x 28in image size, Ed of 15. 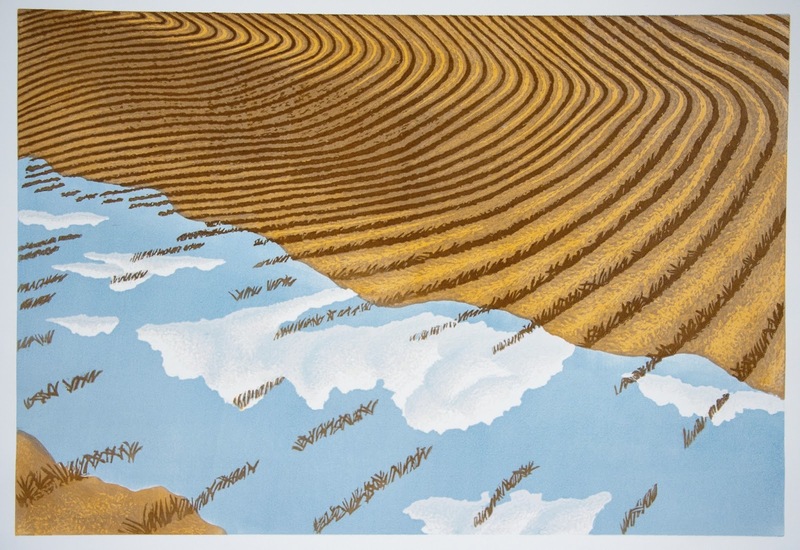 This linocut is a depiction of a field of alfalfa, a plant from the legume family that produces a bluish-purple flower. Even more important than cranberries (the focus on my last linocut), alfalfa is a forage crop that is fed to dairy cattle. Like cranberries, alfalfa relies on bee pollination, in this case to produce seed to replenish the crop. So without bees, we wouldn’t have that milk for your coffee or for your favorite ice cream. Alfalfa is a plant that has been around the world and back. We have records of its cultivation as a forage plant by the Greeks and Romans. It isn’t really a favorite of our imported honey bees. They complain that the structure of the flower smacks them on the head. And many experienced bees remember — so you need lots more bees — and young ones in particular — who are willing to be smacked on the head for the nectar. To the rescue comes our own native alfalfa leafcutter bee who somehow gets the nectar collected and the pollinating done without a fuss. But each of these species is greatly troubled by the use of the pesticides called neonicotinoids. You can read more about this issue in my previous blog. In addition to the challenges of pollination, alfalfa is now positioned squarely in the middle of the water wars of the American West. Western farmers produce alfalfa (irrigated by precious water resources) as a good cash crop, and also as a rotation crop in the fields that grow the vast majority of the produce crops we enjoy. These farmers claim that if they don’t use their allotted water, they will lose rights to it according to current water laws. In addition, some part of this alfalfa crop is being harvested, baled, and shipped in containers around the world. Right now, American alfalfa is feeding Chinese dairy cows. Beauty, fussy insects, water rights — honey, ice cream, the produce that makes up your nightly salad. I am left with a speechless fascination and awe of the intricacy and connectedness of our natural world. How to protect it? Which choices to make? How to make people care, especially when things get complicated — as they do with alfalfa. 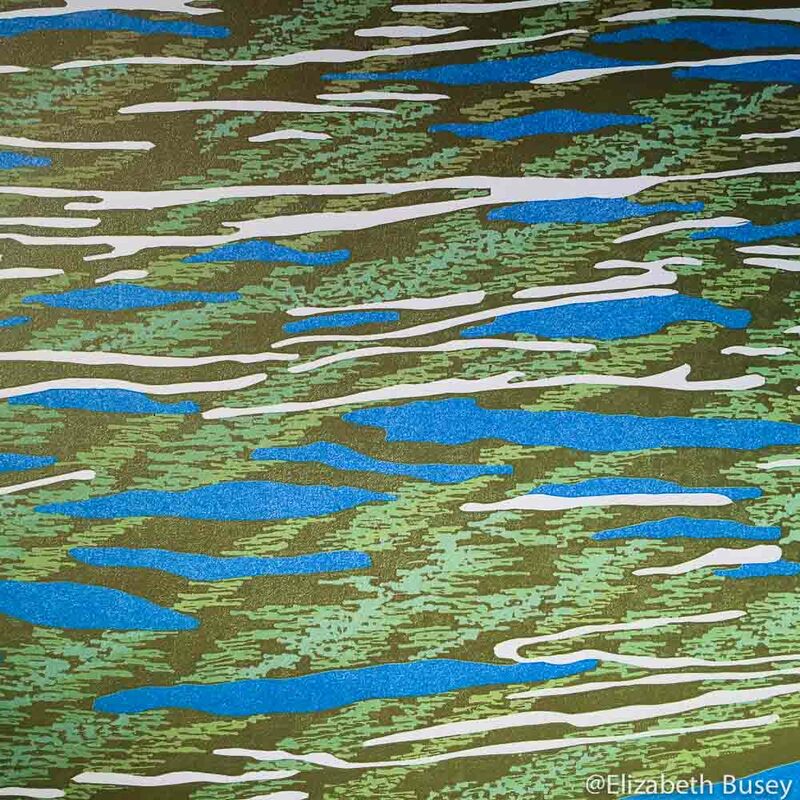 This entry was posted in Environment, Landscape and tagged bees, Linocut, nature, patterns, topography, water on November 5, 2015 by Elizabeth Busey. © Elizabeth Busey. Righteousness as a Mighty Stream. Linoleum Reduction Print, 25 x 40in. This entry was posted in Artistic Growth, Topography and tagged change, Dr. Martin Luther King Jr., glacial, global warming, ink, layer, nature, printmaking, righteousness, streams, water on April 8, 2014 by Elizabeth Busey. I live in a university town. I am continually aware of the predictable changes in life — graduations from high school and college, weddings and first jobs. People move in and out of our town with regularity. Other changes — a surprise award, an illness or a job loss — are not so expected. And their results not so predictable. 25 x 17 in, 2013. 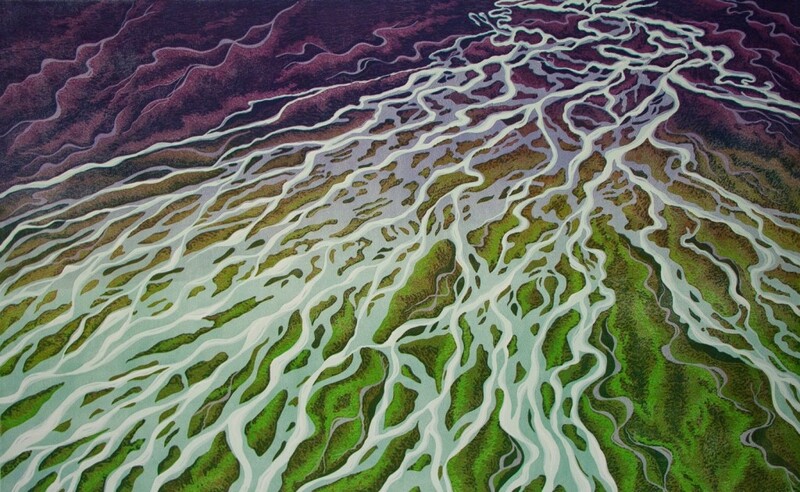 This entry was posted in Commissions, Reduction, Topography and tagged Broad Ripple Art Fair, carving, color gradations, glacial streams, perspective, relief printmaking, sediment, water on May 13, 2013 by Elizabeth Busey. Elizabeth Busey. Hope Despite the Evidence. Linoleum Reduction Print, 17 x 25in, 2013. In the last post I related the saga of my ruining a block and having to start over. This print is the final result of a new block, new paper and many more hours of carving. On the previous block I carved away those crucial corn stalks that extend over the water. Without them, I don’t think your brain would have been able to make sense of things. This entry was posted in Exhibits, Registration, Techniques and tagged BBC, Bloomington Bagel Company, Bloomington Open Studios Tour, complimentary colors, corn, fields, frisket, linoleum, masket, Midwest, mistakes, printmaking, reflections, relief printmaking, water on May 6, 2013 by Elizabeth Busey. The new Tu-Way Drier is working so well that I have two new prints in process. Each has about six layers of ink. I start out my prints with a tracing paper guide that has the most important lines. Then it is up to me to develop the patterns and colors. So I’m in the middle… Here are some quick snaps of the latest work. Print about ice in process. 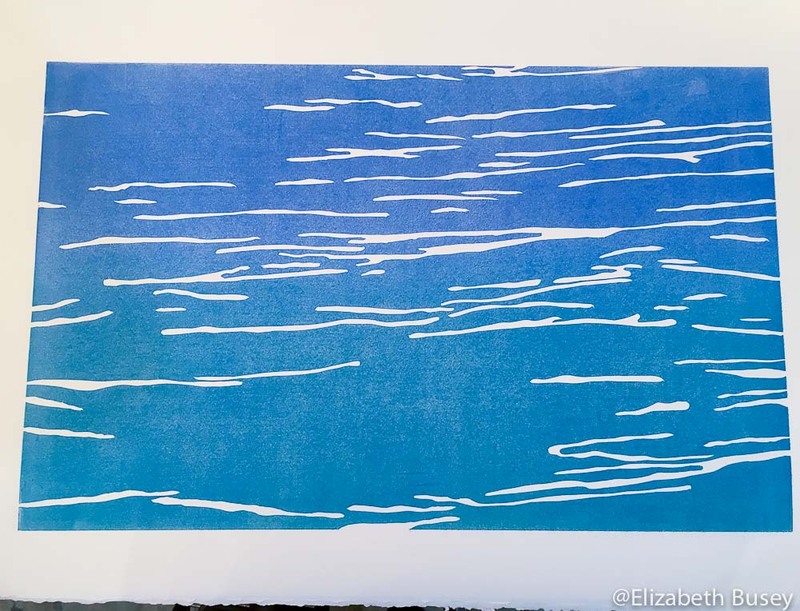 This entry was posted in Color Theory, Materials and tagged color, ice, in process, layers, Linocut, printmaking, relief, water, waves on April 6, 2012 by Elizabeth Busey. February can be a bleak month in the midwest if there isn’t any snow. I am always searching for something new to shake things up in my studio. A Foredom rotary drill arrived at the holidays, and I was finally able to try it out. This entry was posted in Color Theory, Experimentation, Materials and tagged bark, color, color theory, Dremel, Foredom, Linocut, Monty Python, relief printmaking, topography, water on February 8, 2012 by Elizabeth Busey.